The University of Victoria Libraries started archiving websites in 2013, and it quickly became apparent that many scholarly websites being produced by faculty, especially in the digital humanities, were going to prove very challenging to effectively capture and play back. This article will provide an overview of web archiving and explore the considerable legal and technical challenges of implementing a web archiving initiative at a research library, using the University of Victoria’s implementation of Archive-it, a web archiving service from the Internet Archive, as a case study, with a special focus on capturing complex, interactive websites that scholars are creating to disseminate their research in new ways. While “paper survives benign neglect for a long time” (Rosenthal, 2010a), such is not the case with materials on the web. Digital information is far more fragile than print. “Electronic resources are profoundly unstable,” and unlike paper, they are not generally intelligible following even a modest amount of wear and tear (Cohen & Rosenzweig, 2005). Websites are especially problematic because of the ephemeral nature of content on the web itself. The average half-life of a webpage has been estimated at two years (Koehler, 2004), which is almost certainly too generous, and those that do survive tend to change frequently (Dougherty et al., 2010). So while the web’s impact on society has continued to grow alongside an explosive growth of the content available, this rich trove of informational resources remains very much at risk. Roger Highfield (2014) of The Telegraph captures the feeling of many librarians and archivists involved in web archiving when he states: “[i]f we’re not careful, historians will know more about the beginning of the past century than the start of this one.” It is this sense of urgency and obligation that in great part animates web archiving initiatives throughout the world. Web archiving involves collecting data from the web, storing that data and preserving it at some level, and making it accessible to users (Niu, 2012). Julien Masanès of the Internet Memory Foundation, and former director of web archiving at the Bibliothèque Nationale de France (BnF), has identified three main technical approaches to web archiving (Pennock, 2013): transactional, server-side, and client-side. …to send the response to that browser as expected, but also [to] push it into an associated web archive. As a result, all versions of all resources that are being requested by browsers are also available in the archive (Van de Sompel, 2012). Server-side archiving also requires support from content hosts because it involves copying files directly from a server. Server-side archiving can be employed when content, such as a database, cannot easily be captured via HTTP requests. DeepArc is an example of a server-side web archiving tool. Developed by the BnF, it “transform[s] relational database content into XML for archiving purposes” (Aubry & Hafri, 2005). By far the most common form of web archiving is client-side, also referred to as remote harvesting. In this method, web crawlers use the HTTP protocol to collect content directly from a server by crawling all the links associated with a specific ‘seed’ URL. Crawl behavior is determined by providing the crawler with instructions about crawl parameters, such as crawl depth (Pennock). The most well known client-side archiving technology was developed at the Internet Archive (IA), a remarkable organization founded in 1996 by MIT graduate and Silicon Valley entrepreneur Brewster Kahle, with the express purpose of “build[ing] an Internet library” (Internet Archive, n.d.a). It was only after Kahle and his group’s groundbreaking work that “national libraries and archives around the world also began to see the importance of preserving this global resource [i.e. the web]” (Grotke, 2011). As such, many national libraries have established web archiving initiatives. For example, as of 2012, the BnF’s archive consisted of 370 terabytes, or 18 billion pages. In 2013 the British Library conducted the first crawl of all .uk websites, which led to the capture of 30 terabytes of data (Webber, 2014). The Library of Congress had collected 250 terabytes by 2011, and Library and Archives Canada’s collection consists of over 7 terabytes . These and other national collections still pale in comparison to the IA, which contains over 2 petabytes of data and over 150 billion web pages, and the IA corpus grows by approximately 100 terabytes a month (Internet Archive, n.d.b)—larger than the entirety of most national library collections. To provide a sense of scale, the web archives of the Library of Congress—the world’s largest library—grows at the relatively meager rate of 5 terabytes a month (Taylor, 2011). And while the IA has developed an incredibly important resource—the Wayback Machine gets close to 700,000 unique IP visits per day (Internet Archive, 2014)—in the words of Clifford Lynch, “terrifyingly, this major chunk of our cultural memory basically relies on the good offices and good spirit of Brewster Kahle” (Lynch, 2014). To serve the web archiving needs of smaller institutions, several SaaS tools have been brought to market in recent years. In 2005, the IA launched Archive-it, a subscription-based service based on its core web archiving technologies, which it “developed, in particular, for memory institutions and state archives” in order to create curated collections not captured by larger web archiving efforts (Information Today, 2005). The California Digital Library’s Web Arching Service (WAS) is another SaaS tool using Heritrix, Wayback, and NutchWAX—all technologies developed initially at the IA¬—and is used by many institutions, including Stanford and Berkeley. ArchivetheNet (also in SaaS) is offered by the Internet Memory Foundation (IMF) and is used, among others, by the British Library to create the UK Government web archive. …broad national web archive collections, which often only have limited accessibility for legal and technical reasons, may not meet the dispersed needs of individual researchers, and be in danger of providing a “one-size fits nobody” solution. Archiving and providing access to individual historical web resources is the basic “must-have” of a web archive (Hockx-Yu, 2012). In 2013, the University of Victoria Libraries decided to subscribe to the Archive-it service as part of a consortial license negotiated by the Council of Prairie and Pacific University Libraries (COPPUL). Up to this point, while some at the library recognized the importance and possibilities of archiving websites—especially in support of archives and special collections—there was no clearly-articulated demand for such a service by librarians, archivists, or faculty. As such, when the COPPUL offer was announced and the library decided to participate in the Archive-it subscription, it was without a preconceived vision of what a web archiving initiative would look like, or how it would fit into the library’s emerging strategies around digital scholarship. In fact, it took almost eight months before we identified specific websites and started initial test crawls using Archive-it. It has only been since the start of 2014 that we have begun building collections in earnest. These currently include: an events-based collection on the 50th anniversary of the University; several thematic collections in support of our extensive archival and special collections holdings on anarchist and transgender issues, hyper-local news, and environmental organizations; collections of local government websites; and, digital humanities websites. The IA hosts and stores all of the data and provides a web-based interface through which relatively non-expert users can create collections. While the web is often referred to as “the world’s largest library”, this analogy is disingenuous. Academic library collections—or at least library acquisitions budgets—still tend to be dominated by books and journal articles (and the platforms and discovery services that make them accessible in either print or electronic form). Relationships between these kinds of materials—most of which are considered discrete information objects—are not rigorously represented, and they tend to be grouped together based on some shared subjective quality, such as subject matter. This is not the case with archives, which consist largely of primary source materials organized according to very different principles: respect des fonds, provenance, and original order. At most universities, the administrative functions for library and archival acquisitions are distinct. Websites do not respect such organizational arrangements. Articles, reports, newsletters, and other ‘discrete published items’ are common on websites, but website structure—the relationship between documents—is also important. Unlike items on a library shelf, “[w]eb documents at the page level (but also the site level) hardly ever make sense alone…. [t]hey are mingled in a larger document network” (Masanès, 2005). In this way, they are more like archival material, where original order—i.e. site structure—is essential to understanding the whole. And much web content, such as blogs and wikis, is of a kind whose print analogs would usually be found in collections of personal or organization documents in an archive. Furthermore, the use of the term “archive” vis-à-vis web archiving, is also problematic, because in this context the term itself is “much more in keeping with the computing usage of archive as a back-up copy of information then the disciplinary perspective of archives” (Owens, 2014). The organizational lines that often separate libraries from archives suggest that for web archiving initiatives to be successful, participants will have to be willing to work across traditional divides. Jurisdictional issues—if not addressed upfront—can stall a web archiving initiative. In order to address this challenge, our initiative at the University of Victoria is overseen by an Archive-it Working Group with broad representation. This working group consists of people with technical and collections expertise, but also the Associate University Librarian for Learning and Research Resources, the head of Collections Management Services for the library, as well as the Director of Special Collections and the University Archivist. Websites as objects of acquisition can blur the organizational lines between library and archive. But they are also problematic in the same way that a significant amount of open access journal literature is. The advent of open access content is a relatively new thing for librarians. We tend to focus on materials we have paid for. Services like Portico, LOCKSS, and Scholar’s Portal attempt to tackle issues of preservation, but are mostly focused on subscription-based resources. And while work is currently being done by the Public Knowledge Project (PKP) to address the long-term preservation of Open Journal System (OJS) content using LOCKSS (Public Knowledge Project, 2014), open access literature—especially from smaller publishers—tends to be more vulnerable to loss than expensive subscription-based content, simply because no single library necessarily has the incentive to invest in long-term preservation. Websites tend to fall into this same category. Unlike governmental organizations that have a mandate to collect certain types of websites, such as state or national libraries and archives, university libraries and archives rarely have such obligations. For individual selectors, the focus is generally on expending funds for books, journals, research databases, and other paid-for resources. There is often little incentive to build collections of archived websites, which involves a considerable amount of effort, especially when more pressing collection-building activities related to acquisitions are at hand. As such, any web archiving initiative will have to carefully consider how to engage librarians in the time-intensive process of collection building. An article for Wired UK about archiving Britain’s web contains the subtitle: “the legal nightmare explored” (Scott, 2010). This is not far off the mark, and as of this writing, the University of Victoria Libraries is still in the process of finalizing our policy around web archiving. As such, we have not yet made the majority of our collections available to the public. Basically, there are two approaches to dealing with the issue of copyright: opt-in and opt-out. With the opt-in approach, the institution undertaking the web archiving contacts the appropriate content owners to get explicit permission to capture their site. The opt-out approach simply captures sites of interest while respecting the robots.txt protocol, and take-down and other requests are handled after the fact on a case-by-case basis. The opt-in approach is best characterized by the British Library’s approach to the creation of its Open UK Web Archive prior to 2013. Response rates to permission requests were just 24 percent. The CEO of the British Library at the time, Dame Lynne Brindley, considered this approach unsustainable because it would mean the capture of perhaps only one percent of UK websites (Scott). All of this changed, of course, when legislation for legal deposit for non-print resources passed in the UK Parliament in April 2013 (British Library, 2013). As of this writing, the British Library is working on its second annual capture of the entire UK domain (Webber). The Internet Archive uses an opt-out approach, “that allows a website owner/content provider to remove access from the archive, and/or prevent their content from being captured by putting up a robots.txt exclusion on their website” (Scott). If requested by the content owner, the IA will remove a site from public access via the Wayback Machine—but not, importantly, from its central index. [Web archives] represent a unique contribution to knowledge and pose no significant risks for owners of either the sites in question or third-party material to which those sites refer. In the absence of such collections, important information is likely to be lost to scholarship….It is fair use to create topically based collections of websites and other material from the Internet and to make them available for scholarly use. The Library of Congress seems to strike a balance between the two perspectives. While they might seek explicit permission for some sites, “some notice at a minimum must be provided to the site owner” before their site is crawled and captured (Library of Congress Collection Development Office, 2013). Because of the lack of explicit legal precedence and the varying approaches to web archiving across multiple institutions in multiple jurisdictions, it is absolutely central to tackle the issue of permissions as early on as possible, often in consultation with legal counsel. In the 1990’s and even moving into the early 2000’s, most Web pages and site designs were relatively simple. Many used “hybrid” site models that enabled publishers to separate out resources into separate directories and to optimize for different usage scenarios and workflows, but the majority of the emphasis was on more traditional load balancing for scale vs [sic] integration across diverse hosts and services (Netpreserve.org, 2012). Table 1: A file types report from Archive-it for the homepage of the New York Times, August 28, 2014. The File Types report shows how many URLs were captured for each specified file type. 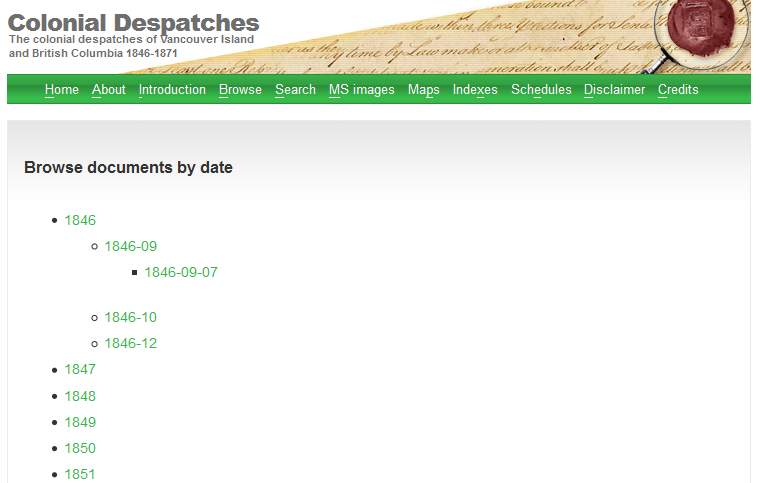 Image 1: A simple version of the application structure of the Colonial Despatches website (http://bcgenesis.uvic.ca/development.htm). Image 3: This content is then embedded dynamically into the page. 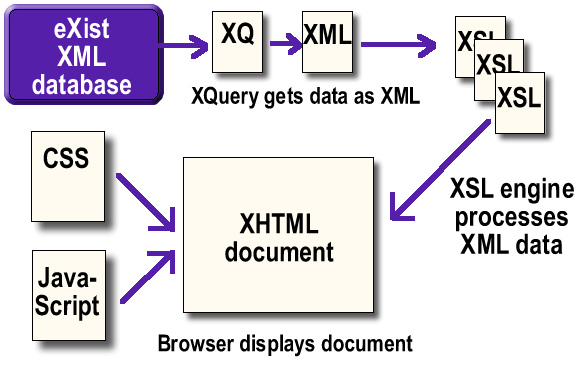 Before the advent of AJAX and similar functionality, dynamically generating XML content for display in a single page was not possible, and users would most likely be taken to another page via an anchor tag (< a>) containing a URL with specific database query parameters. This anchor tag would enable the Heritrix crawler to execute the specific database query via HTTP, get the associated document, and capture it. This example hints at one of the major limitations of all current crawlers, where “web pages that are generated via a database in response to a request from the user” are simply not captured (Pennock). And this limitation is particularly serious as database-driven websites become the norm, and where content is increasingly generated dynamically based on user-initiated HTTP requests, either through form-based queries or via AJAX-driven user interactions. For example, the index page for the Diary of Robert Graves 1935-39 and ancillary material (http://graves.uvic.ca/graves/site/index.xml) can only be accessed via form-based query, which makes it very problematic to access via the Wayback Machine . This is heartening, but the results so far have been mixed. Crawls at the University of Victoria since June 5th have effectively captured popular social media sites like Facebook and Twitter (for which Umbra is optimized), but the above-mentioned issues with AJAX in the Colonial Despatches site occurred during crawls in August 2014, two months after Umbra was released. Again, in this particular instance, the tag might be the problem, and an effective capture might result from using the < a> < a>tag instead, but this is unclear, and the basic issue remains: “crawlers are not able to see any content that is created dynamically” (Google, 2014, June 14). Because of Google’s overwhelming role in content discovery, content creators have an incentive to make their stuff as visible as possible to Google’s spiders. As such—and especially for larger, more commercially-oriented sites—decisions are made early in the creation of sites that allow Google to more effectively index content, such as the creation of site maps in XML. And while SEO is very different than web archiving, the principles are the same. If the library is able to somehow influence decisions at an early stage in the development of websites, these sites can be optimized for web archiving. As such, we have recently started a series of conversations with Humanities Computing and Media Centre on issues of web archiving and digital preservation. We are discussing the possibility of creating some built-in functionality for dynamic sites that would automatically write content into flat HTML for capture by Archive-it, perhaps similar to techniques for generating HTML snapshots for indexing AJAX applications in Google (Google, 2014, June 18). This raises another important issue: what exactly are we trying to capture? 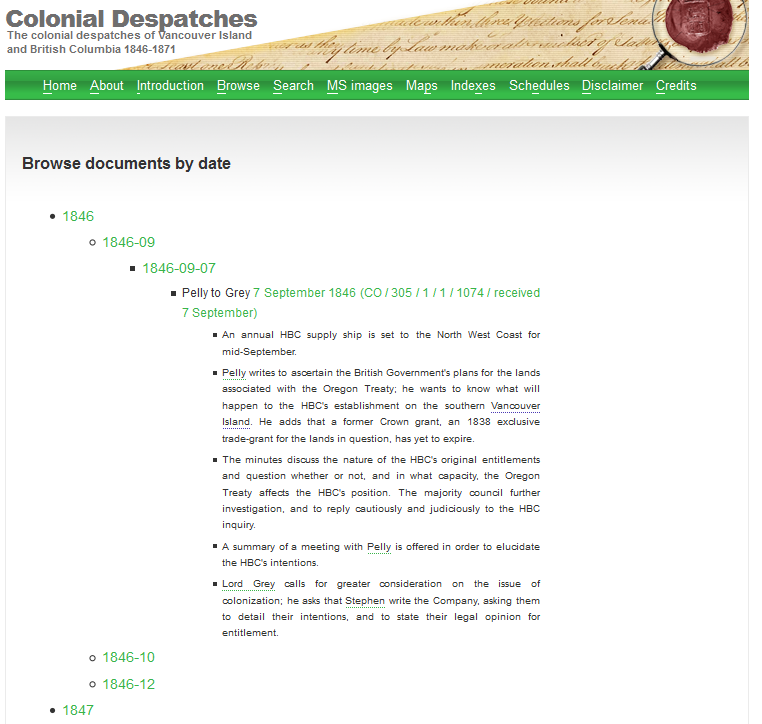 In the case of the Colonial Despatches website, even if a perfect representation of the look-and-feel, functionality, and interactivity could be achieved via the use of a tool like Archive-it, the eXist database containing the marked-up TEI/XML of the original transcribed documents would not be preserved. This database—which represents the majority of the project’s human effort—arguably has more value than the website itself. We have talked with the Humanities Computing and Media Centre about possible capture strategies that include a virtual machine snapshot of the entire OS. In some cases the use of a tool like DeepArc might be an option. Our use of Archive-it has stimulated these kinds of conversations, and it’s clear that this is an area in need of considerably more investigation and testing. Another area of consideration is digital preservation and access. WARC files captured by Archive-it are stored in the United States (Hanna, 2014). For Canadian institutions, this is problematic because the notice-and-takedown provisions of the American Digital Millennium Copyright Act (DCMA) differ significantly from the notice-and-notice regime under Canada’s Copyright Modernization Act. This situation could potentially see the removal of content by the Internet Archive where that content might not have been removed had a similar take-down request been issued in Canada. This is even more troubling considering tools like Archive-it are used to capture sites where content owners might have compelling reasons beyond copyright to see that captured content is removed (politically-oriented and government sites, for example). Where a convincing argument can be made to keep public access available to captured content, having that content located in the U.S. is problematic. Digital preservation is another key issue for web archives. Capturing websites in WARC format for playback and full-text search is only a part of what is needed for true digital preservation. WARC files backed up by the Internet Archive are susceptible to corruption. As David Rosenthal has recognized, the IA can be thought of as a statistical sample of the whole web. Some data loss is to be expected, and this loss introduces an acceptable amount of noise into a very large sample (Rosenthal, 2010b). This is not necessarily problematic at scale, but for the purposes of a single institution, it is concerning. Archive-it does provide users with WARC files on request, which can then be managed locally. At the University of Victoria, we are considering obtaining copies of our WARC files for processing by Archivematica and storage in the COPPUL Private LOCKSS Network (COPPUL PLN). Archivematica is an “open-source digital preservation system that is designed to maintain standards-based, long-term access to collections of digital objects” (Archivematica, n.d.). Archivematica can ingest WARC files, which are run through a series of processes based on the Open Archival Information System Reference Model (ISO-OAIS), which allows for future preservation planning based on format identification and other information. Archivematica creates Archival Information Packages (AIPs) from WARCs using Bagit. These ‘bagged’ files can then be uploaded to the COPPUL-PLN, where a single copy, if damaged, can be repaired by other copies in the network. None of this potential Archivematica/LOCKSS integration development work is trivial, especially the creation of a manifest for LOCKSS to harvest AIPs from Archivematica, but it is important to recognize that jurisdictional issues and considerations of digital preservation may require the local management of WARC files to ensure ongoing access and long-term preservation. The collections being created by the University of Victoria Libraries are unique in the world, and even though the act of capturing websites is a messy affair, there is real value in capturing content that would almost certainly not be around by the time today’s students become tomorrow’s researchers. The importance of the web as part of the human record cannot be overstated, but there are significant challenges any organization faces in starting a web archiving initiative. Organizational, legal, and technical challenges all need to be addressed. Corey Davis has been with the University of Victoria since 2012, where he works as Systems Librarian. He has a particular interest in the long-term preservation of born-digital materials. Prior to joining UVic, he was head of Technical Services at Royal Roads University Library. One Response to "Archiving the Web: A Case Study from the University of Victoria"
Great article. Just a minor correction – we (The British Library) do not run the UK Government Web Archive. The National Archives of the UK does that. Thanks.